Divyanka Tripathi and Karan Patel's romantic dance performance at Zee Gold Awards 2015 is a major highlight of the show. Zee Gold Awards 2015 was a star-studded event, laced with side-splitting gags and power-packed performances by TV celebs. Ali Asgar, Gauahar Khan and Jay Bhanushali entertained the viewers with their unique hosting skills and hilarious acts. Divyanka Tripathi and Karan Patel's romantic dance performance was the highlight of the show, while Pooja Sharma-Vishal Singh put up a stellar act. Anita Hassanandani, Sara Khan, Ravi Dubey, Hrithvik Dhanjani, Sanjeeda Sheikh, Aamir Ali, Asha Negi, Jayati Bhatia, Shruti Ulfat, Kiku Sharda, Gautam Gulati, and Hina Khan were other performers of the night. 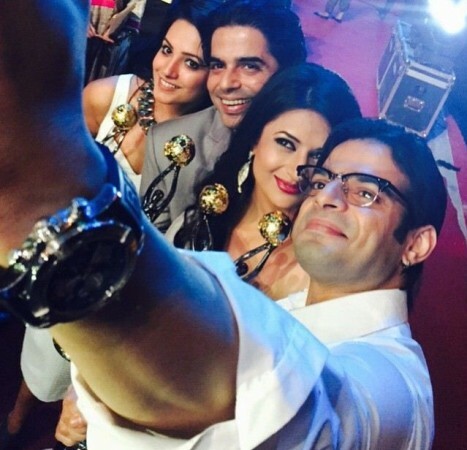 On the awards front, "Yeh Hai Mohabbatein" walked away with the biggies: Best Actor (Popular) Karan Patel, Best Actress (Popular) Divyanka Tripathi, Best Actor in a negative role Sangram Singh, Best Actress in a negative role Anita Hassanandani and Best Actor in a supporting role Raj Singh Arora.